Recorded in Norway at the Woodscave Studio. and mastered by the WSL Studio in France, and with artwork by Khaos Diktator (ARDITI, NORDJEVEL, HORNA etc.) “Pyres” is the follow up to SVARTELDER’s “Askebundet” EP, which was released on Dusktone last year. Founded by frontman Doedsadmiral, SVARTELDER’s lineup includes Maletoth on bass and guitars, AK-47 on drums, and Kobold on keys. It is this lineup of musicians, with an extensive experience garnered over the years and hailing from different musical backgrounds and influences, that gives SVARTELDER’s Norwegian Black Metal sound a distinctive edge. If you are interested in reviewing “Pyres” please email info@dusktone.eu and ensure you include links to your publication/zine/music blog etc. 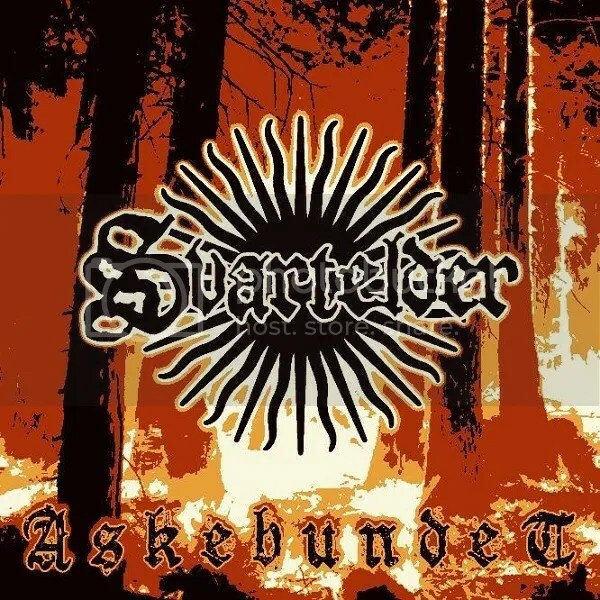 The CD version of SVARTELDER’s 2015 EP “Askebunded” is available from https://dusktone.bandcamp.com/album/svartelder-askebundet-dusk029cd whilst the digital version is available from http://svartelder.bandcamp.com/album/askebundet-ep . Norwegian Black Metallers SVARTELDER, whose lineup comprises members of CARPATHIAN FOREST, NORDJEVEL, IN THE WOODS, DEN SAAKALDTE, PANTHEON I, OLD FOREST and DOEDSVANGR, have released details of what will be the band’s debut full length album. Titled “Pyres” and set for release on Dusktone in April of this year, the six-track album will be available as a digipack CD , as well as a Limited Edition A5 Digi CD limited to 100 copies, and a 300 copy Limited Edition vinyl. A preview of the artwork by Khaos Diktator (ARDITI, NORDJEVEL, HORNA etc.) which will be used for the album can be seen below. Recorded in Norway at the Woodscave Studio. and mastered by WSL Studio in France, “Pyres” is the follow up to SVARTELDER’s “Askebundet” EP, which hit the streets last year, also on Dusktone. Aside from founder and frontman Doedsadmiral SVARTELDER’s lineup comprises of Maletoth on bass and guitars, AK-47 on drums, and Kobold on keys. There is no doubt that the band’s sound is firmly rooted in black metal, but SVARTELDER’s strength lies in the fact that not only is its lineup vastly experienced, it is also able to draw that experience from a variety of different musical backgrounds and influences. And this is something that allows the band to mix different elements together, bringing a fresher, more varied, approach to the overall sound. Originally formed several years ago by frontman Doedsadmiral (NORDJEVEL, DOEDSVANGR), Norwegian Black Metallers SVARTELDER have hit the ground running after a lengthy hiatus. With a freshly inked two-album deal with the Dusktone label, and with a new lineup that includes members of CARPATHIAN FOREST, IN THE WOODS, DEN SAAKALDTE, PANTHEON I and OLD FOREST, SVARTELDER are gearing up to bring their particular take on Norwegian Black Metal to a wider audience. As well as the two full-length albums, the first of which is set to appear in early 2016, Dusktone will also physically release the band’s “Askebundet” EP, which has so far only appeared in digital format. The CD version will include an additional bonus track that is not available on the three-track digital version, and will hit the streets later this year. Aside from Doedsadmiral on vocals, SVARTELDER’s new lineup is comprised of Maletoth on bass and guitars, AK-47 on drums, and Kobold on keys. The inclusion of these highly skilled and experienced musicians into SVARTELDER’s ranks has expanded the band’s original sound, which is firmly rooted in Norwegian Black Metal, into something much more fresh and varied, with each member bring with them their own set of influences and a variety of different elements. With a revitalised lineup that includes members of CARPATHIAN FOREST, IN THE WOODS, DEN SAAKALDTE, PANTHEON I and OLD FOREST, and following the release of the “Askebundet” single, Norwegian Black Metallers have bowed to the pressure from fans eager for more material, and self-released a three-track digital EP. Whilst the calibre and provenance of SVARTELDER’s musicians is no mystery, their individual identities are. Formed and fronted by Doedsadmiral, the rest of the lineup comprises Maletoth on bass and guitars, AK-47 on drums, and Kobold on keys. “It’s probably not that hard to work out who is who” commented the band, “but hopefully there will remain a bit of doubt as we really wanted people to judge SVARTELDER’s music for itself, rather than comparing how one or other of us played or sounded with other bands” .